Secretary Of Steak | Lover and blogger of all things food, craft beer and steak. Lover and blogger of all things food, craft beer and steak. After several friends telling me I needed to try this place, I finally ventured over to The Plaza District to Saints, an Irish restaurant and bar. Being an Irish lass myself and a fan of traditional Irish fare, what I liked most about Saints was that it ISN’T like every other campy Irish pub with the usual fish and chips or corned beef and cabbage…they are calling themselves a restaurant and I think that’s perfect because this food isn’t pub food at all. 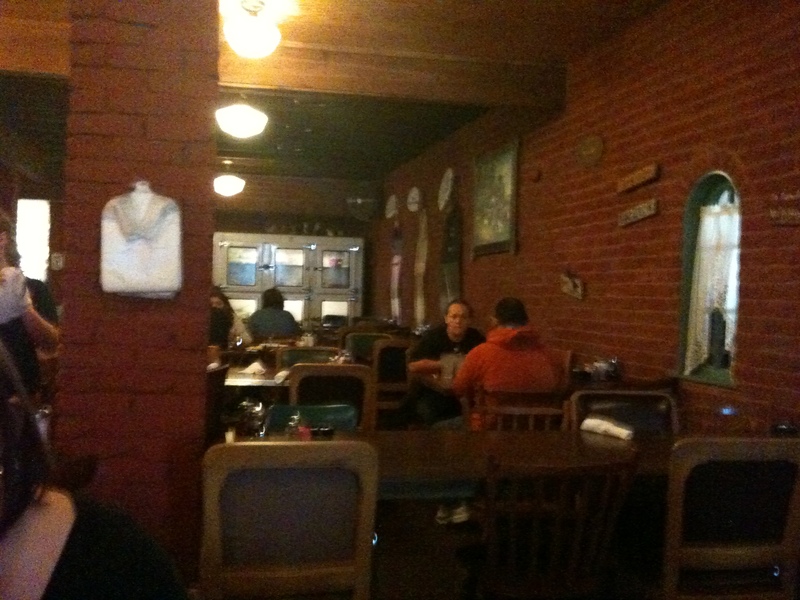 I went in thinking that this place would have shamrocks on the menu and perhaps a harp hanging from the ceiling, maybe even loud Celtic music blaring …but what I found was a clean, industrial style, comfortable environment with not even a leprechaun on the wall – not to mention we sat down to Smashing Pumpkins playing overhead. I knew that the focus was going to be on the food and not the stereotype. 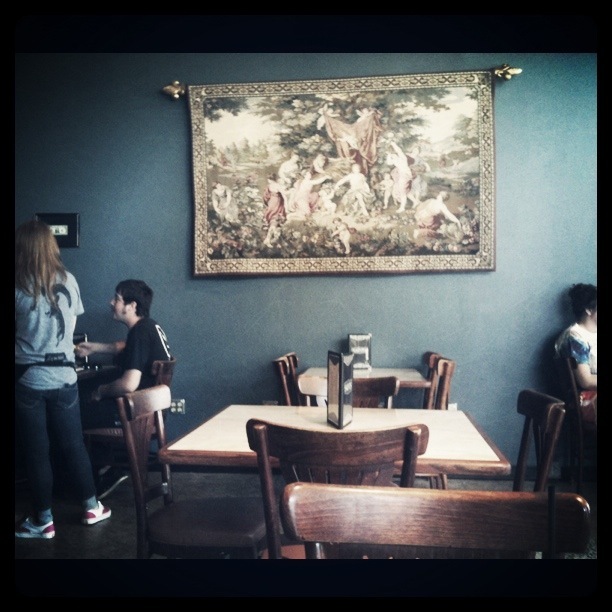 We were greeted by very friendly waitstaff and were only one of four occupied tables on a Saturday at lunch. You know how much I love a dining experience that isn’t crowded. When presented with the menu I was happy to see that it was one page, front and back, with a separate drink menu. The thing a lot of people don’t get about Irish food, that Saints does get, is that it’s not the battered and fried fish or the potato-heavy plates that most pubs serve to the drunk tummies of their patrons – Irish food is actually very healthy, deliciously simple, strong in flavor and compliments the resources available to Ireland. Irish food is of course about potatoes, but also about leafy greens, vegetables, lamb stews and soups, fish and beef. And please don’t forget the bangers and rashers. We Irish loooooove our pork. Saints’ menu had a perfect representation of all the items I would look for in TRUE traditional plates and even had the options for “Small Plates” or “Big Plates”. Within the small options there were a few that caught my eye – the stuffed white fish which is baked white fish stuffed with seasoned bread crumbs and wrapped with rashers, or to you Yanks, Irish style bacon. Also within the small plates are smoked salmon potato cakes, rashers and hash as well as lamb pie. On the big plates side, which you know is where this girl made her choice, were baked fish and chips, hickory smoked beef tenderloin with horseradish aioli, smoked salmon salad, a mustard chicken sandwich, a meatloaf sandwich (made of a mixture of lamb, pork and beef) as well as a vegetarian sandwich called “the clover”. I chose the sandwich as suggested by our waitress and the Hubs picked the banger dogs. But wait! There’s more! I didn’t even mention the amazing drink menu! A very impressive whiskey selection – what is an Irishman without his whiskey? 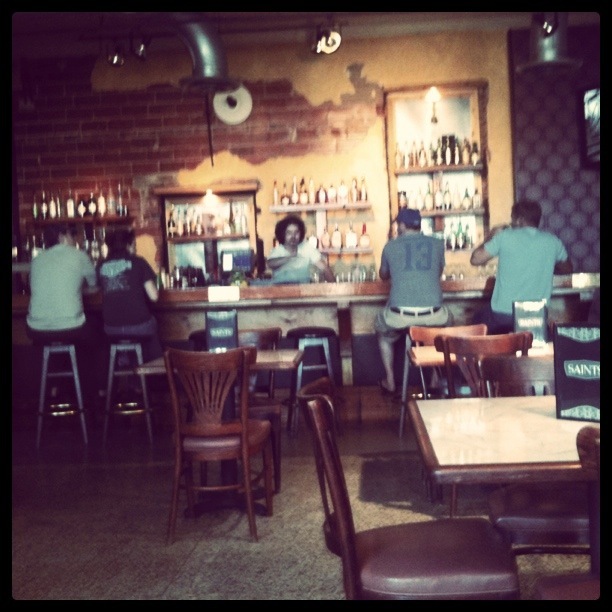 – a wide choice of spirits and thankfully some local brews like COOP DNR and Red Bud Ale. 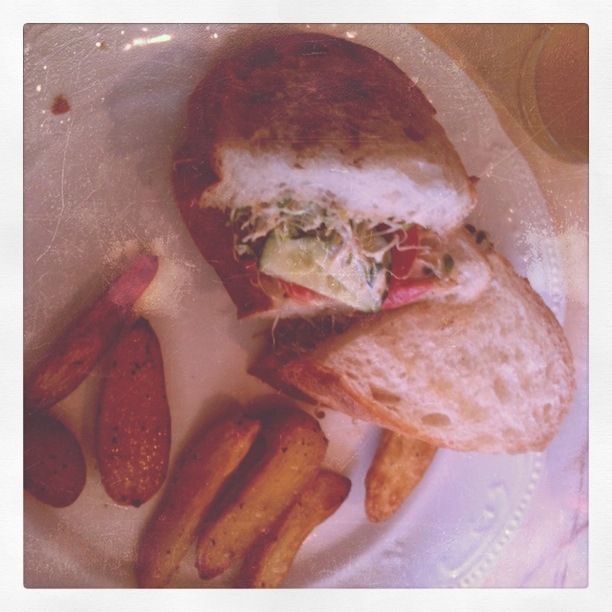 The food comes out and looks wonderful…my sandwich is small but just the right size for me. It is served on batard, which is similar to baguette, with avocado, roasted gold potato (yes, potato on a sandwich), tomato, clover sprouts, topped with a horseradish aioli and served with a side of fingerling potatoes. The batard had a very crunchy buttery crust, just the right amount of chewy, and a soft center. 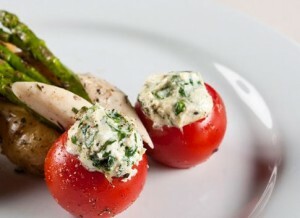 The horseradish aioli was a great flavor match to the gold potato mixed with the avocado, cucumber and clover sprouts. The fingerling potatoes, which kind of served as the “high class fries”, were tender, seasoned and lightly coated in what I think was olive oil. I really liked the idea of these potatoes instead of the usual greasy pub fries. I was in love with this sandwich and didn’t even miss the lamb or the pork I felt Irish guilt for not ordering….until I tasted the banger dogs. The banger dogs are made of Irish sausage (totally different flavor from any sausage usually found in the states) on a bun topped with sweet pickled relish and stone ground mustard. These little dogs were perfection – and probably the best bangers I’ve had since being in the motherland. I would have liked to trade the Hubs half a sandwich for one of his dogs, but I knew that wasn’t going to happen since all he was saying between bites was, “ohmygod this is amazing…”. He was right – the seasoning of the meat was spot on and the slight vinegar and pickled crispiness of the relish’s purple cabbage meshed so well with the mustard. Holding it all together was a soft on the outside/toasted on the inside bun that must have been placed on the same grill the bangers were cooked on. Saints got it right on the money – these bangers were amazing. Basking in the afterglow of our meal we made plans to return again very soon with friends we know would love this place as much as we did. Saints not only has food that makes my wee Irish toes curl, but the environment is inviting and the staff’s friendliness makes you want to stay for many pints and many laughs. It’s a great place to find delicious traditional food, good drinks and great times with friends. May the road rise to meet you and may it take you directly to Saints. Slainte! Follow them on Twitter – @SaintsOKC and like them on Facebook! If there were any Weiner that should be making the news right now, it’s certainly NOT a U.S. Representative – and if said Representative were going to be sending pictures of a weenie, it should have at least been one worthy of social networking – one made by Mutt’s Amazing Hot Dogs. As a huge fan of hot dogs (hey, I could have said “wieners”) I was excited to hear about this new and original brain child of culinary geniuses Cally Johnson and Kathryn Mathis – also of Big Truck Taco fame – and couldn’t wait to see what the ladies had come up with. I knew it would be something unlike what anyone had ever done with wieners in this town (*smirk*). After an afternoon at Oklahoma’s first Craft Beer Festival we decided to have a very late lunch and try to avoid the crowds – which was a good idea. 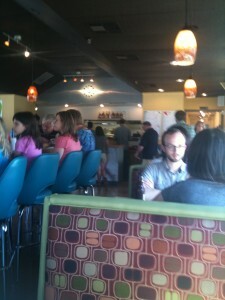 After we got a table the flood gates opened and there wasn’t an empty seat in the house. I honestly don’t even know where to start with the menu. It is like nothing I have ever seen before…and that’s a good thing. The menu has “standard dogs” and “specialty dogs” but it’s a stretch to call them “standard” – any weenie wrapped in bacon should shake it’s fist at being called “standard”. The first one on the list and quite an eye-catcher is the S’noran…bacon wrapped with cheddar jack cheese, pico de gallo, mayo, chipotle ketchup, pinto beans, sliced avocado and mustard. Wow. I keep going…I pass a dog with queso, a dog with provolone, cole slaw and french fries, a Chicago style dog, one with kraut, one with chili – then I spot the wiener I’ve been waiting my whole life for – The Club Dog. The Club Dog has a bacon wrapped weenie, avocado, tomato, chopped onion, jack cheese, sliced turkey all on a poppy seed bun. Please and thank you! Sold. Now I’m thinking about sides, which on MAHD’s menu is another at least 5 minute decision for me. Deviled eggs? Maybe. Red skinned potato salad? Mmm hmm. Cole slaw? Okay. Wait – what does that say? DUCK FAT FRIES – and I can add truffle oil?? And OHEMGEE – fried pickles??? This can’t be real. Yeah, this is happening…I’m all over that like a NY representative on Twitter. 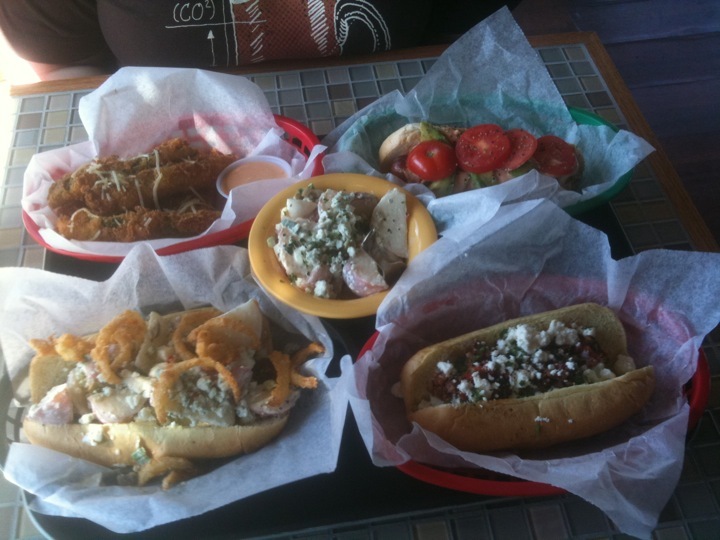 After the Hubs decides on the Ardee Dog (kobe beef dog, truffle aioli, potato salad, blue cheese and fried onions) and the Apollo Dog (lamb sausage, kalamata olive and sun dried tomato relish, feta cheese and cucumber yogurt) we decide to take our seat to wait on our buns filled with glory. We were sad to learn that two drink items we were excited to have, the Tang and the Kool-Aid, were unavailable. To make matters worse we were informed that they had run out of duck fat fries. This was most devastating to us considering that it was probably the thing we were most looking forward to…but there’s always next time, right? Maybe it’s because we had just left the Craft Beer Festival where we tasted amazing brews made right here in Oklahoma…but we were also disappointed in the lack of decent beer selections at Mutt’s. 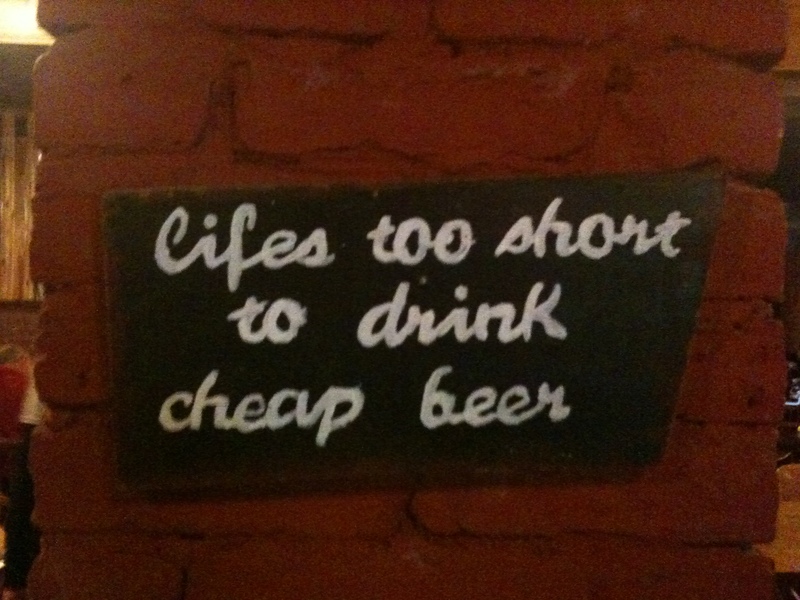 No COOP, no Battered Boar, no Marshall, no Choc – but they did offer PBR and Bud Light. Yeah….I’ll stick with Dr. Pepper. 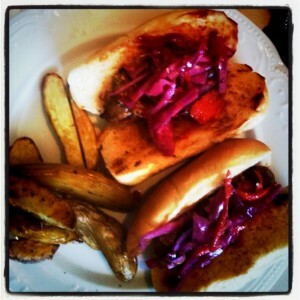 Finally our tasty franks were ready and we dove in. I don’t know what it is about a poppy seed bun but it had me at hello. The bacon, the avocado, the tomato with the sliced turkey – it was perfect. I can’t think of one bad thing to say about this hot dog!! The celebrity of my dinner had to be the fried pickles…move over, McNellies….these pickles were the best I’ve ever had. This wasn’t a basket of little pickle rings – oh no – they batter up the whole beautiful spear. A nice thick coating of crispy batter and a sprinkling of grated parmesan cheese on top with a perfectly complimentary sauce they call “pink sauce” – I’m not sure what it is, but I wanted to order a pint to-go. Good stuff. Hubs, my bearded man of few words, stopped eating his kobe beef dog and lamb dog long enough to say ‘they’re good” – so that’s a solid thumbs up from him as well. I have many friends who have different culinary “preferences” that are different from mine and that can make going out to dinner a challenge but as I knew they would, these ladies have offered choices that make Mutt’s a nice neutral ground for me and my friends. In addition to the various pork choices, beef, lamb, bison, wild boar, Spam, bologna, chicken, rabbit and duck – they also offer kosher beef, tofu corn dogs, salads, falafel dog and veggie chili. I’m pretty sure anyone with any dietary restriction or religious dietary preference would be able to have multiple choices, delicious choices, on this menu. 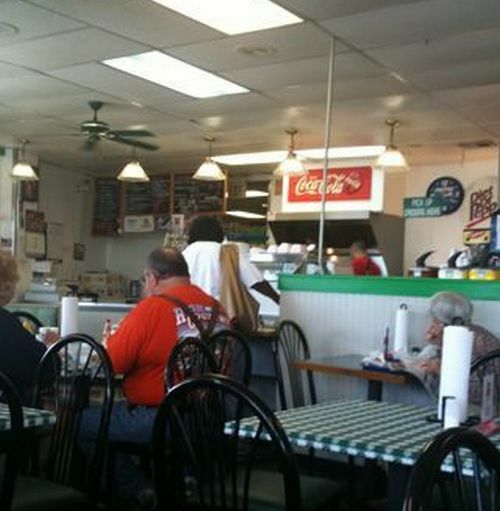 Kudos to Cally and Kathryn for making Oklahoma known for it’s diverse wieners! I know you’ve heard about this place…and I know you’ve talked about going….but it’s time to make a trip. 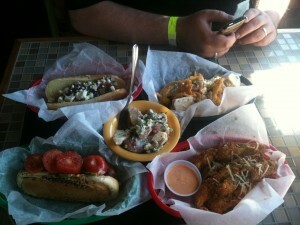 Mutt’s offers delicious choices that you aren’t going to find anywhere else. 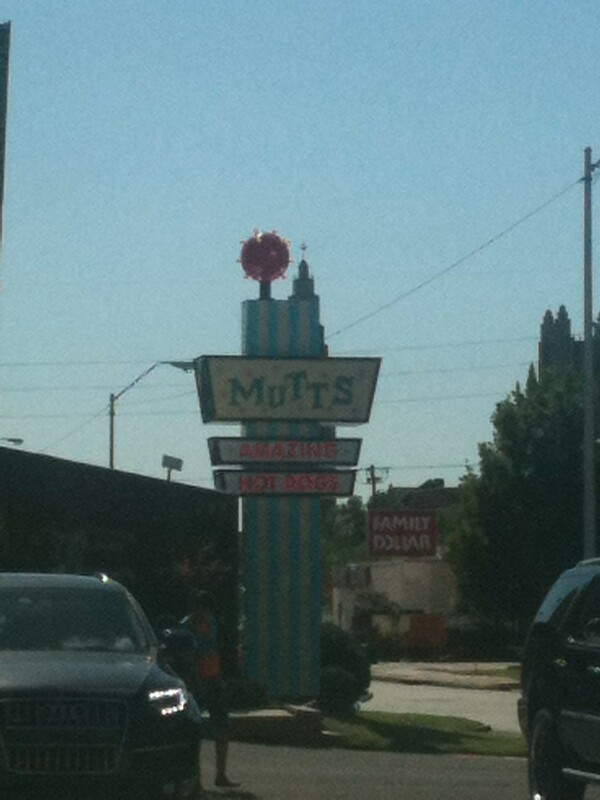 Next time you send a picture of a wiener over Facebook or Twitter, let’s hope it’s a tasty Mutt’s original. Be sure to “like” Mutt’s on Facebook! 7 wonders of the world. 7 days in a week. 7 deadly sins. 7 continents on Earth. God created the world in 7 days. 7 Harry Potter books. Lucky number 7. 7 even seems to be a pretty important number in many religions and cultures…and as a girl married to a man who has 7 letters in his first name, 7 in his middle name and 7 in his last name – I figured Cafe 7 was a pretty safe, and perhaps lucky, bet for me. 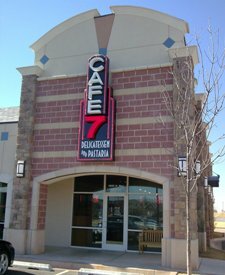 Cafe 7 Delicatessen & Pastaria, or “Cafe 7″ as we all call it, was started by Paul Sorrentino, J. Mays, Leslie Wiley and Chris Kana. Paul is a former instructor at OSU’s School of Hotel & Restaurant with Jay, Leslie and Chris being described as “top students”. On our first visit to Cafe 7 we were introduced by some mutual friends to a gentleman described as “the owner” who was very welcoming and friendly and even gave us a free cookie. It’s nice to see someone being able to live out a dream and making it a successful one. Paul, Jay, Leslie & Chris have a very original idea going for them and you know I’m all about local originality…and mixed with food – it makes my heart happy. Did I mention it was 7:00pm when we got there? Okay, I’ll stop. 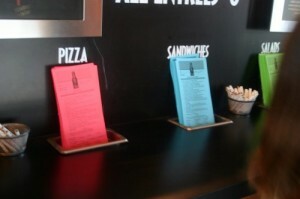 When you walk in the door you pass by the first step in the Cafe 7 experience – the choice cards. You grab a mini pencil and a card of your choice – sandwiches, pastas, pizzas or salads. You write your name and color in the circle next to your carefully made decision as you’re reminded of Scantron test forms in high school. The awesome thing about these cards is the lack of prices listed – can you guess why? Yeah…that’s it. Everything is $7. Just wait…there are 7 items in each of the categories and they get your order ready in 7 minutes or less. I promise I’m not making this up. Oh yeah – and they’re open 7 days a week. No, I’m serious. With this difficult task of choosing ahead of me, I try to focus and pick from the list of sandwiches that all sound amazing. Hot ham & cheddar, turkey & guacamole, Italian, Cuban, chicken salad and turkey & Swiss. You can also build your own by picking from your choice of meat, cheese, dressing and toppings. I decide that the Cuban is the way to go along with a side of the Cafe 7 signature pasta salad. I could have had the loaded baked potato salad, the fresh fruit or the soup of the day…but when something says “signature”, I feel like you have to at least give it a try. After a very short 7 minute wait (exactly) my Cuban comes out looking perfect. Just in case you have been in a cave and are unaware of the joys of a Cuban (no, not talking cigars or men) let me just tell you about this sandwich – Cafe 7 loads the Cuban with smoked pulled pork, ham, banana peppers, shaved red onion, pickles, Swiss cheese and dijonnaise sauce on a toasted hoagie. The pork had just the right amount of smokey flavor…not overwhelming but definitely detectable in the background. Probably my favorite part of a Cuban is the pickle…it really does make the sandwich pop with the peppers, onion and Swiss cheese as the side kicks. The hoagie was toasted just how I like it – a crunchy, crisp outside with a soft, fresh-baked taste inside. Sometimes you can get bread that you just know people with dentures are scared to even take a chance on. 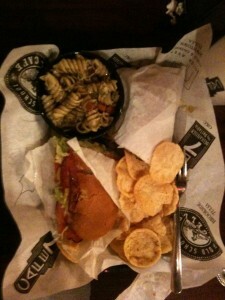 The pasta salad had a great tangy seasoning to it and was a perfect portion to go along with my sammy. The Pop Chips on the other hand were not my favorite thing….I know we’re trying to be healthy considering 4.5 out of every 5 Americans are hugely fat, but to me these chips taste like seasoned cardboard. I’m not a fan. The claim to fame with these chips is that you can eat a whole bag for only 100 calories. Yeah…that tastes about right. Kudos to C7 for making a stand for nutrition…but really? I just got a sandwich with two different kinds of pig on it – I think I’m okay with fatty chips. Before you give up on me too, just know that I even shocked myself with this comment but sadly, I stand by it. I felt like the bacon flavor was way too heavy and it completely drowned out the taste of the sauce, the cheese and even the taste of my “made-from-cardboard” Pop Chips. The fancy bread crumbs on top couldn’t even salvage this. I could tell by the look on my Hub’s face that he was betrayed and disgusted by my comments and he defended the dish saying that it was “perfect”. Then again, this is coming from a man who would be in favor of using bacon as currency. He LOVES it. In fact, he cannot bring himself to order anything else when he’s there. If I had to say one good thing about his bacon mac & bacon cheese it would be that the pasta was cooked just the way I like it – perfectly al dente. Overdone pasta makes me a sad clown. Other good things to say would be that Cafe 7 offers some good bottled beer…not your traditional weak domestics, but some actual quality brews. As if taken from an isle behind the pearly gates, right next to the beer is a case of amazing looking cupcakes – strawberry, red velvet as well as carrot with cream cheese icing and French vanilla with chocolate butter cream icing next to vanilla with chocolate butter cream icing. Large, soft cookies also were available – oatmeal, chocolate chip, peanut butter and sugar. We did have a free chocolate chip cookie to taste and it was like no other cookie I’ve ever had…it had a very original scone/cake taste and texture to it that I really enjoyed. 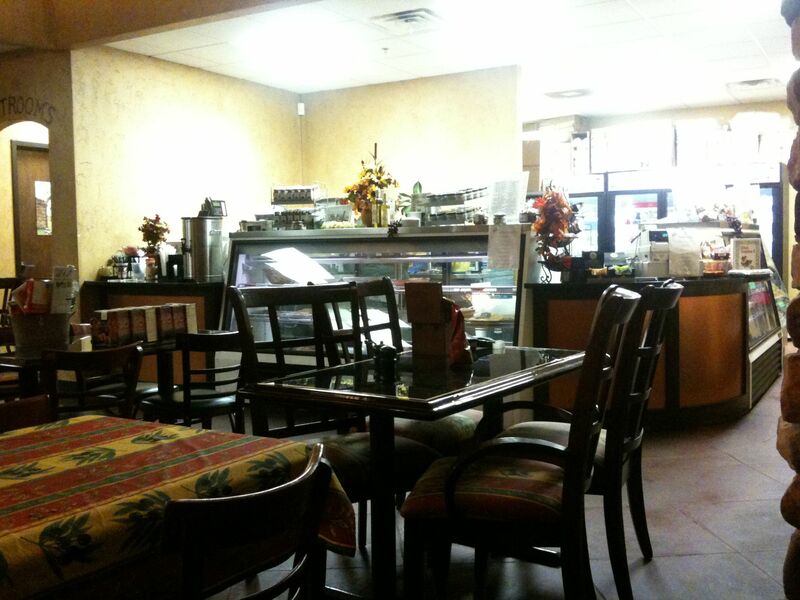 With easy access to Edmondites as well as OKCers, Cafe 7 offers a fresh, local take on the traditional sandwich, pasta, pizza, salad place you’re used to. 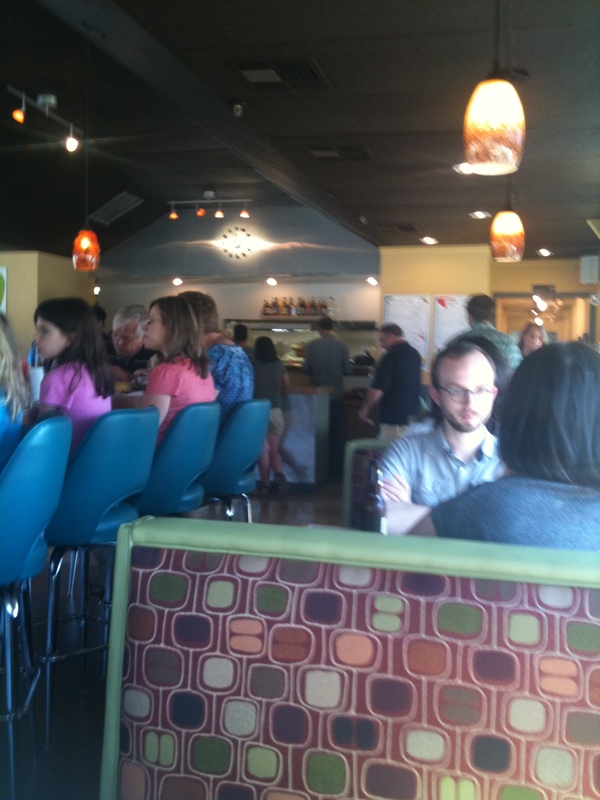 Lines can be out the door during lunch and dinner hours and all those people can’t be wrong. Next time you’re at Quail Springs mall and you don’t want to deal with teenagers crowding you while you eat or the possibility of a flash mob singing show tunes in the food court, take the short drive to Cafe 7 and I promise you’ll be glad you made the less than 7 minute drive. Once upon a time, an Oklahoma City girl with excitement in her heart and a growl in her tummy (and great hair) got off a plane in Dallas, TX. She wandered outside and gleefully hopped into a car driven by her best friend. 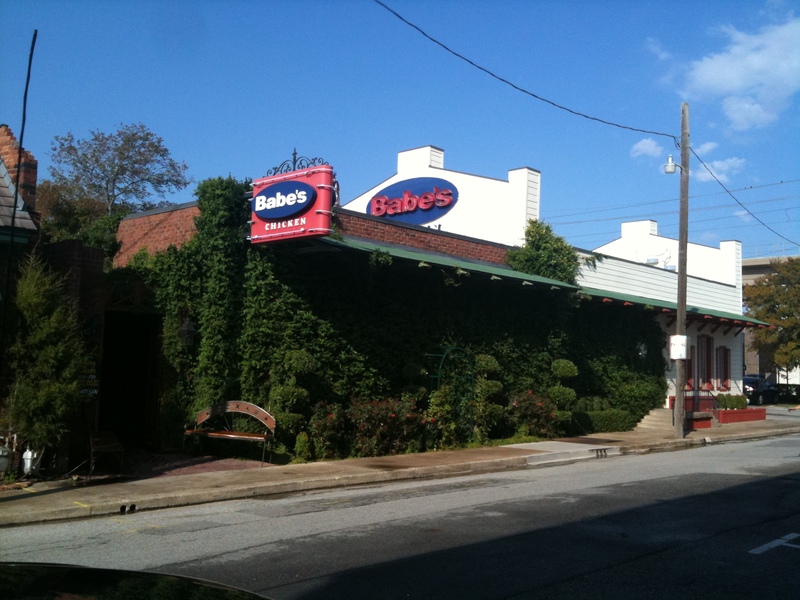 After hugs between friends, who miss each other terribly, her friend said a few magical words this girl had been longing to hear….”We’re going to Babe’s for lunch!” – and they ate happily ever after. Okay, in all seriousness, I have been hearing about this place for years and have been dying to go. I visit Dallas quite often to see friends and it seems that I’m never in the right area. The day had finally come and I was going to experience this fried chicken, mashed potatoes & gravy, corn and biscuit extravaganza that I have heard such reveries about. I was so excited I could barely contain myself – hanging out with my friend AND fried chicken? Sorry doc…not counting calories today. A short drive from the airport takes us to a quaint little town called Carrollton with lots of shops, antiques and little local storefronts located in the beautiful historic buildings established in the 1800s – which is hard to imagine since you can practically see the DART in the background. When we arrive at Babe’s Chicken Dinner House I was amazed at the beautiful walkway leading to the restaurant…I wasn’t expecting a fried chicken joint’s front door to look like a place of holy matrimony you might see in the small town in Oklahoma where I grew up. We are greeted by a group of waitstaff doing some very energetic line dancing smack dab in the middle of the dining area. Yes, I’m deep in the heart of Texas, but still was not expecting this. I mean, the stars at night weren’t even big and bright. We are greeted at our seats by the friendliest waitress who had an accent much like my southern mother’s. She assured me and my friend that she was about to take “real good care” of us. Bring it. 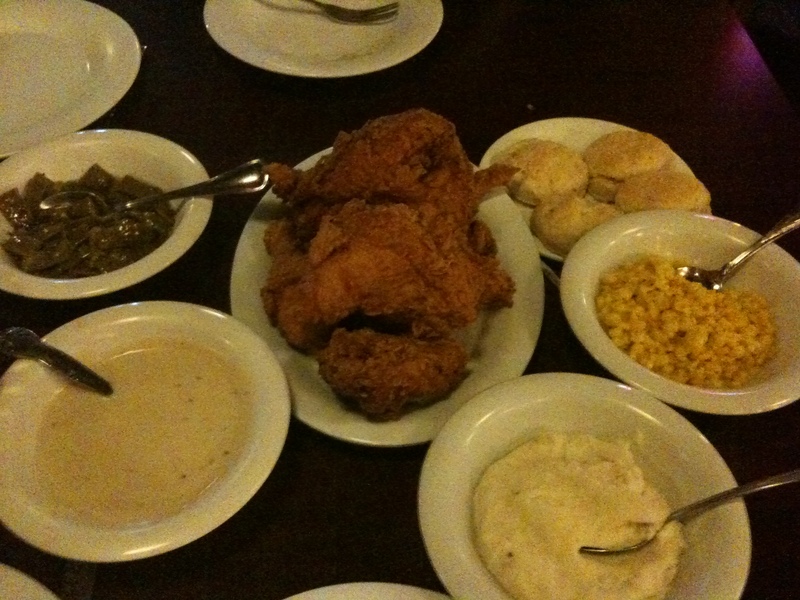 I’m not sure exactly what point I knew this was an amazing decision – it may have been when our sweet waitress said I had only one decision to make - fried chicken, chicken fried steak, fried catfish, chicken tenders, smoked chicken or pot roast. Or it could have been when she said every meal came with salad, mashed potatoes, cream gravy, corn, green beans and biscuits. WHAT? Are you kidding me? Is this place real? Is there a basement in the Alamo? Well, unlike the basement in the Alamo this place WAS real and I was beyond ready to see what our table was about to look like in a matter of minutes. I went with the famous fried chicken and waited in hungry anticipation. As our family style chicken and veggies arrived my mouth was watering at the beauty of it all. Two girls sitting at a table with easily eleventy billion calories and carbs on it. Not a problem for these Green Country girls – we strategically attacked these morsels with a quickness. I started off with a chicken breast because let’s face it – it’s the best. This piece of chicken did not disappoint. I did, however, learn that my friend and I have something in common that we never knew…we both eat the skin first. Ohhh the delicious skin. Crispy, well seasoned and delicious. The breast meat was moist, tender and fell right off the bone. When done correctly, fried chicken MIGHT, I said MIGHT, be even as good as steak. I will never admit I said that. I tried to pull myself away from this crispy delight long enough to be reminded that I had other treats waiting on me. First, the corn. This corn must have been cooked in straight butter because it was amazing. Another thing my friend and I did alike was mix together corn, mashed potatoes and gravy…how else does one eat these things?? Green beans were my favorite kind – Italian style – salt, pepper and perfect. I was in heaven…surely it can’t get better than this – but then I spot to my right a plate of homemade biscuits, steaming and in dire need of some butter and honey. Okay, okay, push aside the chicken, the veggies in gravy and experience this flour filled anomaly. I know I have this amazing cream gravy at my fingertips, but oh no – not these dough treasures – nuh uh, they get honey…and not just any honey. Babe’s honey is Texas Brush Honey which is made from, according to the website, bees from Catclaw, Mesquite, White Brush, Huajillo and Persimmon. I’m not sure where those places are, but they must be suburbs of Flavortown. After filling our bellies with as much goodness as possible we were offered dessert but there was no way that was going to happen. Despite our inability to partake, many others in the restaurant were able to enjoy Babe’s famous chocolate meringue pie, lemon meringue pie, coconut meringue pie, banana pudding and pineapple upside down cake. If only. We got our leftover chicken to-go and waddled to the car with happiness in our hearts and magic in our tummies. 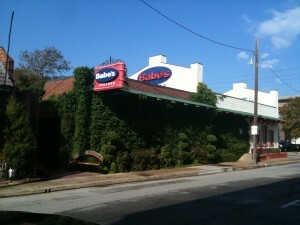 If you are ever hungry, really hungry, and want some home cooked food better than your mom could dream of making, check out Babe’s. They’ve got several locations in Texas and it’s worth the stop. 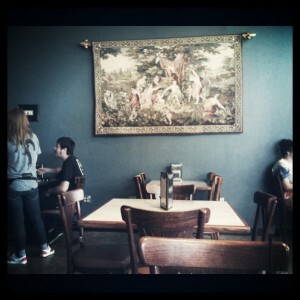 If you were to tell me yesterday that I would be blogging about a place on Memorial…I would have laughed in your face. 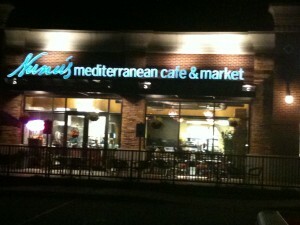 I feel like Memorial Road is where chain restaurants and douchey night clubs thrive – not amazing delicious eateries. I now must admit to being wrong. I hate that. Nunu’s Mediterranean Cafe & Market is a jewel and I highly recommend wading through the crappy beer special signs, Affliction shirts and popped collars you often see on Memorial Rd to find this diamond in the rough. We were greeted at the door by none other than Nunu herself whose first words to us were, “OH! Thank you for being here and not attached to a TV watching the OU game!” and I knew we would be fast friends. Nunu offered help with the menu – which included a falafel sandwich, baba ghanouj, lentil soup, greek salad, fatoosh and even vegetarian plates - but the Hubs and I had already spotted the item on the extensively desirable menu that would suit both of us – the Sampler Plate. Ohhh yeah. Bring it. But wait – one of my favorite things on this big, green, watery ball on which we live is falafel – but I didn’t see it on my sampler! Never fear – Nunu hooked me up. Proper. 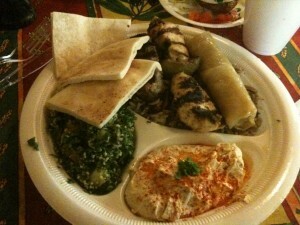 The sampler plate included hashwa, chicken kabob, beef kafta, cabbage roll, tabouli, houmos and pita bread. Now let me break this down for you – hashwa, which is Nunu’s signature dish, consisted of beef, rice and “special seasonings” cooked in clarified butter and topped with toasted almonds. I’ve never had this but I was very impressed. The seasonings in the beef paired perfectly with the nutty taste of the almond slivers. Next was the falafel - ohhhh yes – the falafel. I’m not sure if it’s chick peas or fava beans – but I do know that it was – THE BEST FALAFEL I’VE EVER HAD. 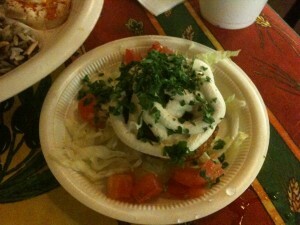 The crispy, warm flavorful falafel was topped with what I think was Nunu’s Lebanese version of tzatziki. I could have easily eaten only this and been just fine. We all know THAT wasn’t going to happen. After finishing off the falafel I moved on to the chicken. Those of you who know me know that I DO NOT ever get poultry. I do not order it in a restaurant and I cook it at home with a constant grimace on my face. It’s boring, reminds me of dieting, it’s not worth the energy it takes to chew and I have yet to find a way to eat it other than fried where I don’t want to gag. Nunu’s chicken kabob was different – it was perfectly cooked, had a great grilled-on-charcoal taste and wasn’t dry at all…very moist and very well seasoned. I can honestly say I enjoyed this grilled chicken. Not sure I’ve ever said that before. After the chicken I attacked the cabbage roll with passion – THIS IS THE BEST CABBAGE ROLL I’VE EVER HAD. As I type this, I am drooling thinking of that magical roll and when I might be able to have it again. Mind you, I am NO cook – I have not even an ounce of professional culinary training – I just like to eat. I have never made a cabbage roll and I wouldn’t know where to start. I say this because I have no idea what that specific spice is that is usually too strong for me when it comes to cabbage rolls – cinnamon maybe? – but it wasn’t too strong this time, it was perfect. Just the right amount of rice, beef, garlic and a touch of lemon juice made it’s flavor tasty and balanced. Mmmm. 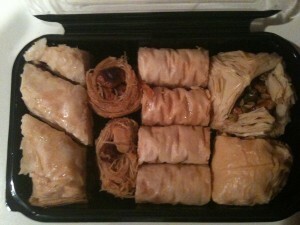 I loaded my fork with some of the hashwa then topped it with a slice of the cabbage roll – perfection. Tabouli, pita and houmos come with every meal and it’s a good thing – the houmos was the exact creamy texture that a good houmos should be and went along beautifully with the tabouli. My only complaint is that I prefer my tabouli light on the parsley side…and as fresh and tasty as it was, I could have done with a little less parsley. That being said, I’ll still get it next time I’m there because it’s delicious…I’m not letting a little parsley scare me off. The cool thing about Nunu’s is that besides serving up all this amazing traditional food this little place also has a deli and market (hence the name). The glass counter has many scrumptious foods for sale that can be taken home to prepare or to be enjoyed there. Many items like international teas and chocolates are also available to purchase that you wouldn’t normally see in your grocery store. The environment was very friendly and welcoming which I think led to me & the Hubs not realizing that we were 13 minutes past closing time and not quite finished eating. Anyone who has ever worked in food service, or any service for that matter, hates when it’s closing time and patrons don’t seem to care that you want to get home to your family or friends….so I asked for a to-go box and took our treats with us. When I apologized for being inconsiderate of their time Nunu was all smiles and said, “No worry…I knew you wanted some baklava anyway.” And she was so very correct. 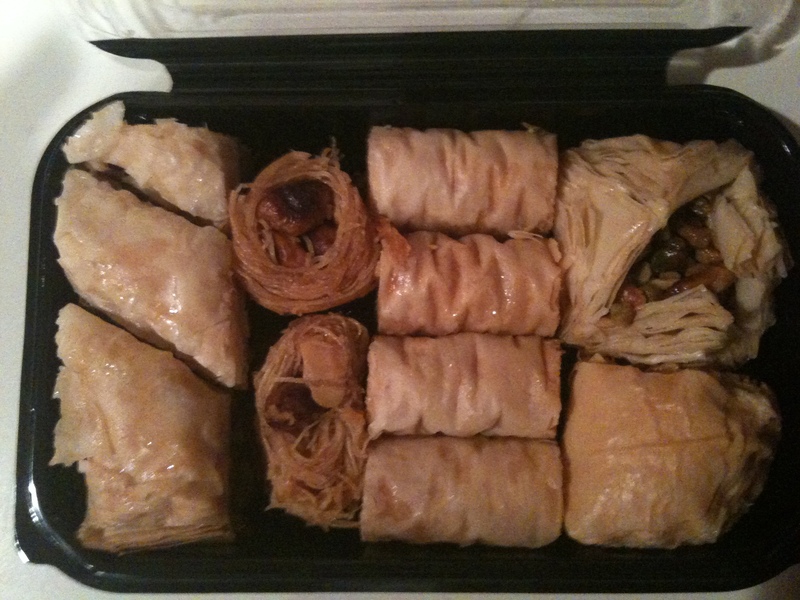 We decided on the baklava assortment pack sitting by the register but Nunu put it back and picked another one…”you need this one – it has the walnut baklava and the birds nests…you will like it better.” I felt like I had found the Lebanese grandmother I never had, paid for the baklava and we left hoping we hadn’t kept her from closing her shop. As we walked out another couple walked in and were turned away due to closing time. We were lucky to have made the cut and even luckier to have found a local business owner who loves sharing her passion for traditional food and flavors with the people of OKC. Some might think that apple pie is the pinnacle of American food but I tend to think the obvious choice to unite us as a country is the burger. When I’m going to have one of those meals I keep secret from my doctor it’s always going to be a burger. We all like our burgers different ways – cheese, mayo/mustard, bacon, jalapenos, onions, pickles, BBQ sauce….so many options and also so many ways to get it wrong. All of us at one time have had one of those burgers that you know was frozen or even questioned if it was actually beef we were putting in our mouths – like the meat patty on my burger at the hospital cafeteria. Little Mike’s Old Fashioned Hamburgers is NOT one of those burgers. Making meaty deliciousness since 1977, Little Mike’s (on NW Expressway just east of Rockwell) makes a huge impression for being a not so huge place. Located inside a strip mall next to a tag agency, you might almost miss it…but those burgers are not to be missed. Also shocking is the diverse menu…this place even has 6 different kinds of veggie burgers along with a chicken sandwich, coneys, chili, Caesar salad burger, Hickory burger and even a low-carb menu. Impressive. The cheeseburger was my choice and I threw in a side of onion rings…because when a place has onion rings, you get onion rings. The beautiful girl who took my order was young but was more than polite and gave me a great first impression. WARNING – I’m about to say something that makes me feel OLD – but I hate when kids working in fast food joints act like they would rather be at home listening to Dashboard Confessional or cutting themselves than take your lame order for the measly $7 per hour he/she is banking. This sweet one didn’t even act like she was missing the latest episode of Gossip Girl to help me out. She directed me to the pickle bar after my order was put in where I could load up on my choice of dill or bread & butter pickles, onions cut in rings or diced, relish and jalapenos. The mayo, mustard and ketchup were there as well to either be pumped or taken away in packets. Brilliant. None of this “no pickles, no onions, no mustard, only mayo” stuff that my picky friends tend to throw at these establishments….it’s all right there for you to make your own picky choices if you are so inclined. The burger comes out plain and you dress it how you like. Smart Mike, very smart. 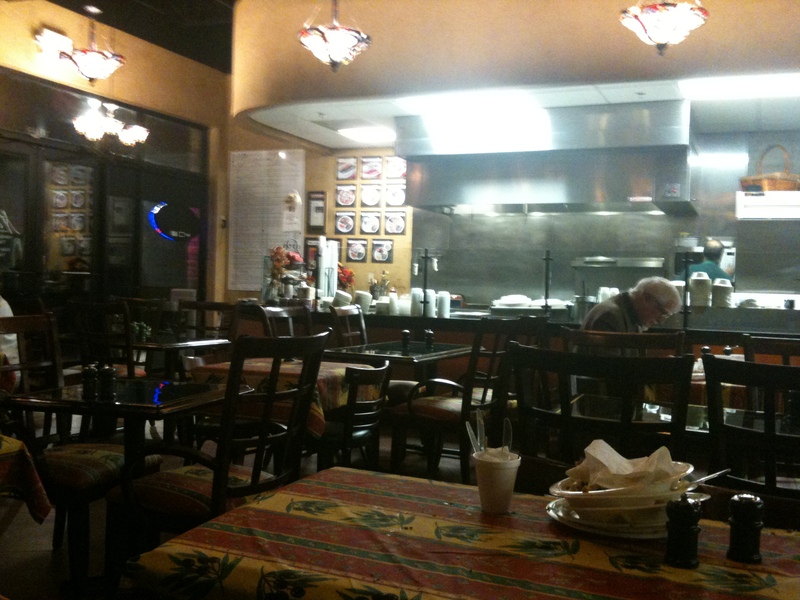 While I took a seat and waited on my meaty treasure I started to look around at the decorations. This is where Little Mike’s might lose some of you…but please, hang in there. The walls are covered in anti-Obama, pro-gun, war-supporting, right wing, ultra conservative Republican sentiment. Several shirts are hanging up for sale, one of which says, “I’D RATHER BE WATERBOARDING”. One whole wall is covered in 8 1/2 x 11 papers with quotes from founding fathers and other historical figures pointing out the importance of limited government and the power being with the people. One sign says, “AMER-I-CAN, REPUBL-I-CAN, DEMOC-RAT” I thought to myself, “wow…every burger comes with a side of politics…” – but honestly – isn’t this what’s GREAT about America??? The business owner, who is on site the majority of the time, can cover his establishment in his own thoughts and beliefs with no regard to whom may or may not agree with him. I love that he felt comfortable enough to do that but it did make me want to get out of there…quickly. I get uncomfortable around that kind of political aggression. 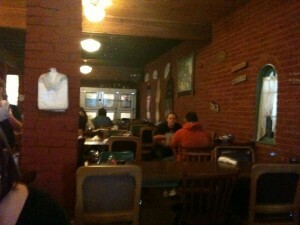 It was almost like I was in Glen Beck’s Burger Barn. I do not agree with it, but I love that I live in a country where it’s possible and legal. Mmmm…freedom of speech is tasty. My burger was finally ready and I couldn’t be happier with our first meeting. The cheese was fully melted on top of a thin, crunchy, onion burger patty which smelled much like what I imagine “going into the light” will smell like. Heaven. I dressed my meaty treasure with mayo, bread & butter pickles, more onions and tomatoes (which the beautiful girl reminded me I might need). The hubs and I argue about burgers because this is the only thing I’m really picky about – I like my burgers thin. I don’t want it too thick but too thin isn’t good either…and don’t you DARE hand me a homemade burger. *GAG* I won’t do it. I leave that to professionals only. 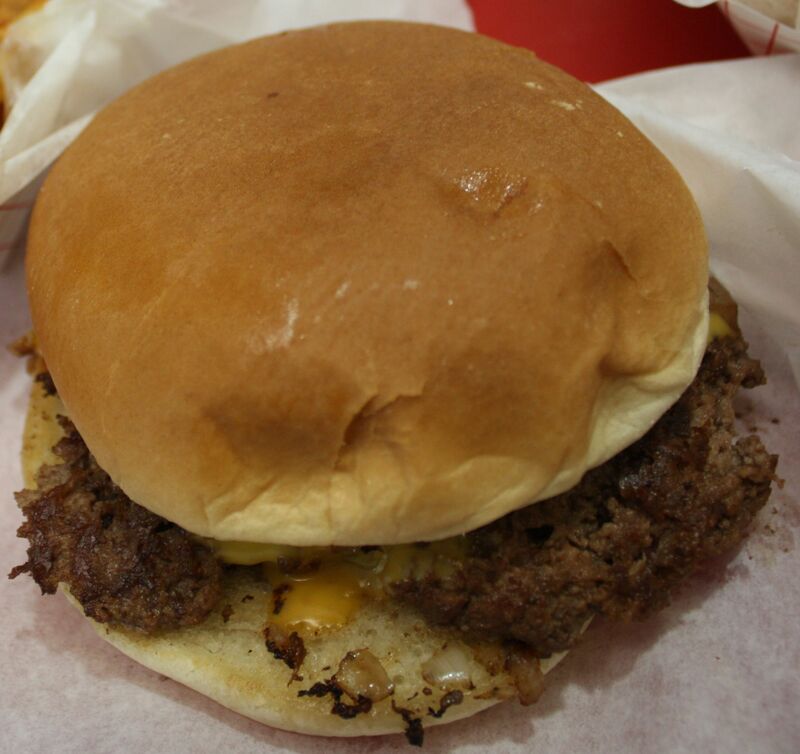 Professionals like Little Mike’s Old Fashioned Hamburgers. The meat, which is ground fresh daily, was seasoned with just the right amount of salt and pepper and was just as tasty as it was fresh. You can tell when you get good quality beef…and this burger is the best onion burger I’ve ever had. My onion rings were large and perfectly fried…not too floury and not too greasy. The onion rings were truly the perfect companion to the burger and though the fries could have made me just as happy…I was glad I chose the rings. Next time you’re looking for a good burger place drive by all the drive thrus and instead spend your hard earned dollars at a local business that really will appreciate you…and you might even come out with a new opinion or two on politics. You know how people will sometimes ask you, “Know of a nice place I could take someone for a dinner date?” and you have that one place you always recommend? Well, I have a new place. 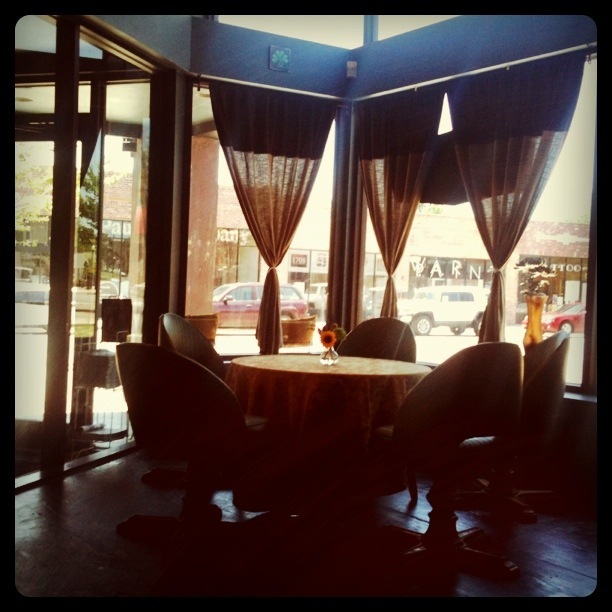 Signature Grill in Edmond meets all the expectations of that special spot you would take someone to make a great impression and have a wonderful dining experience. 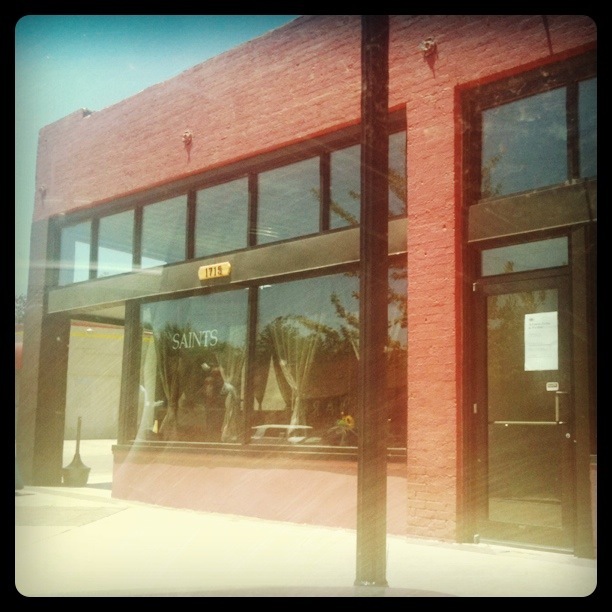 Everything from the intimate dining environment to the amazing menu to the helpful staff…it was perfection. We went on a Monday night…our anniversary (7 years, awww…I know, right?!) and had reservations for 7:00. I wasn’t sure what to think since the place sits in a strip mall but I pride myself on not judging books by their covers. Once we walked in and saw the place I knew we were going to have a good night. It’s tiny…crackerbox in fact…but only 3 other tables were occupied and we were reserved a nice table set apart from them all. Nothing I hate worse than walking into a place and being sat right next to the only other occupied table in the house. 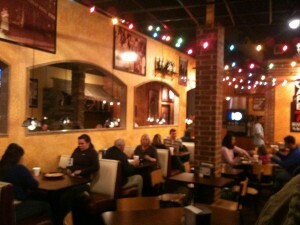 The lights were dimmed, the chefs were visible from the dining area and the room was a very comfortable temperature. It’s important with an open kitchen like that to not make your dining room as hot as the cooking area – the only thing sweating should be your veggies. We both agreed that we were going to try a wine, despite the fact that we know as much about wine as we do sports (which is NOTHING), and decided to go with the Franciscan cab-sav. Who knows if that’s even a good wine…but we loved it. 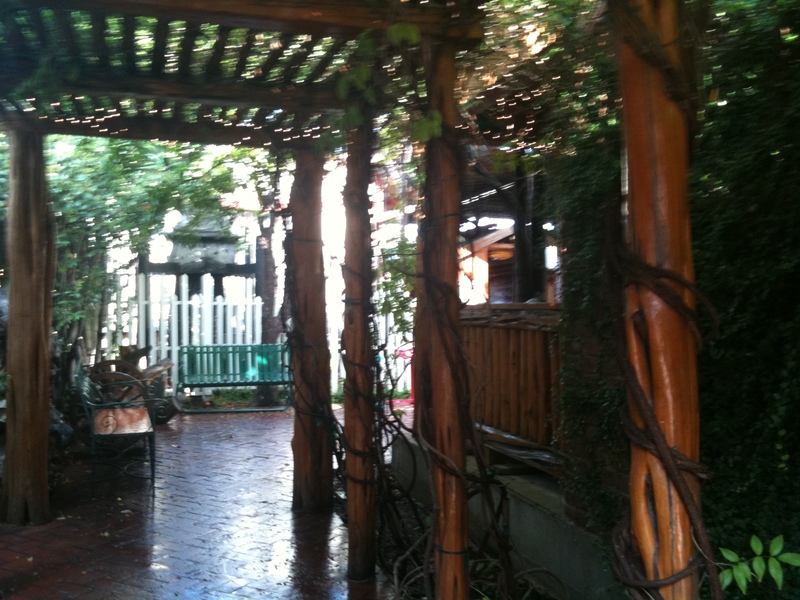 I also love being greeted by friendly waitstaff…and our waiter was amazing. Very helpful with the menu and gave great suggestions. It’s the difference in Hillary High School being your waitress and getting someone who knows what they’re doing. It really can make or break your experience. We start off with a brilliant appetizer: puff pastry wrapped and baked with duck confit, Portobello mushroom, bacon, tomato, spinach and gorgonzola cheese with brandy demi glace. Hard to picture, right? What came out was a puff pastry “wrap” of sorts that was flaky, flavorable and perfect with the brandy demi glace drizzled over the top. It was put together so well that you had a hard time picking apart the ingredients because they were all perfectly married together. Duck confit AND bacon? Are you kidding me? Yes ma’am. Those two on the same playground as the gorgonzola – a match made in Heaven. Our next course was the baby spinach salad with basil balsamic vinaigrette, honey glazed pecans, sweet onions, fresh strawberries and gorgonzola cheese. The vinaigrette was the perfect compliment to the combination of the sweet strawberries, sweet onions and the sweet nuttiness of the pecans and the tartness of the gorgonzola cheese. This may be the best salad I’ve ever had. I said may be. I am only 31. My main course was the grilled 8 oz beef tenderloin with smoked bleu cheese and Cabernet Sauvignon wine reduction. I teetered between the duck breast and the beef…but in the end, I am calling myself the “Secretary of Steak”…so I had to let my red-blooded Oklahoma cattle-loving heart lead the way. My heart was right. 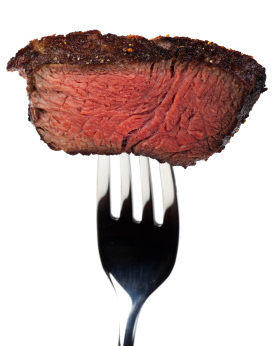 I am usually a “medium rare” girl, but sometimes I get nervous in new places, unsure of what exactly MR means to different places…so “medium” came out of my mouth when he asked how I wanted my tenderloin. ‘DOH! Fear not…it was perfect. A dark pink, barely warm, gorgeous center peeked out at me as I cut into that beautiful piece of meat and had my way with it. The smokiness and sharpness of the bleu cheese mixed with the grilled taste of the crust on the beef was magical. I enjoyed all 8 oz of that treat without hesitation – and who knew this craft beer girl would love the way the wine would also be a welcome guest at my culinary party. I must also give credit to the back up singers who made this stellar performance possible – stuffed tomatoes with goat cheese & spinach and bacon & crimini mushroom risotto. So I’m guessing you’ve figured out by now that cheese also plays an important role in my life happiness…and these stuffed tomatoes are no exception to the rule. Small enough to be “bite size” but enough flavor to hold their own. Sold. The risotto had just the right amount of bacon and in it as to not overwhelm the taste of the mushrooms…and I might be wrong, but I think the flavor angel may have just cried a few tears of bacon grease into the risotto to leave her fabulous mark. Could be wrong – but that risotto was very, very right. As you can imagine this petite lady (HA!) was all out of room for dessert but I can only imagine that Signature Grill can deliver some remarkable desserts and I can assure you next time I will make a point to give it a shot. 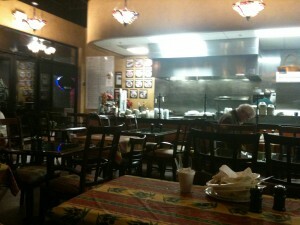 There will for sure be a next time because Signature Grill impressed me – big time. It’s nice to feel like you’re the only table in there and that the people cooking for you are as excited about you trying their culinary creations as you are experiencing them. Hope you will think of it next time you have a client, spouse, partner, friend or family member you are trying to impress! Welcome to Secretary of Steak! So here it is. My “for fun” project…Secretary of Steak. I eat and drink – a lot – so why not make a project out of it? My amazing hubs always tells me, “find what you love and make that your job.” Well, I love my job but I love food and drink so very much more…which has led me to start this foodie style blog. What I hope to do with SoS is to share my personal views on the places I like to visit the most – restaurants, coffee shops, food vendors, bars & pubs. I hope to improve the eating/dining/drinking experience of those who are interested by recommending places one might not think to go. I’m no professional…nothing qualifies me as a “critic” and I hope not to be one. I just love food (yes, mainly steak), coffee, craft beer and good friends. I love suggestions and advice on places to visit – and not just in my neck of the woods…anywhere my heart and my stomach so chose to take me. Feel free to tell me exactly where to go…well, you know, nicely please. Just getting started so check back often for updates! Cheers! © 2019 Secretary Of Steak. All Rights Reserved.